A few years ago, he moved to 190 Main Street. Settling into the famed Sally’s Place record shop, he kept that old-fashioned feel and his many loyal customers. He added plenty of new ones too. The man had never redeemed it — never been to Ron’s, in fact. It took a decade. But today, Ron Provenzano made a customer for life. 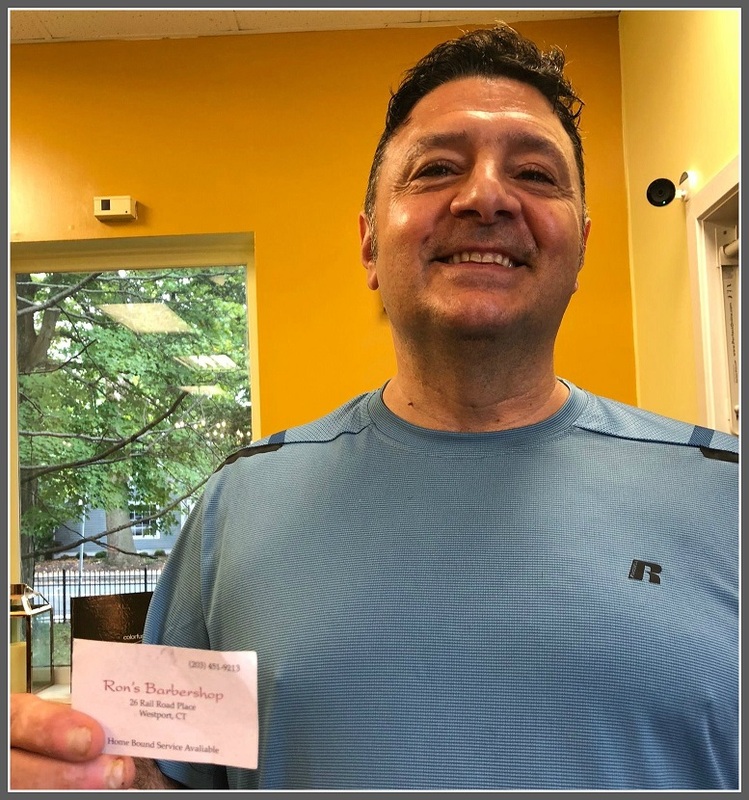 Ron Provenzano, and the 10-year-old business card. This entry was posted in Downtown, Local business, People, Saugatuck and tagged Ron Provenzano, Ron's Barber Shop. Bookmark the permalink. Such an awesome man and great barber! Having been a customer at Ron’s barber shop for years when we were in Westport, this story does not surprise me. And, I think this shows that the spirit of Sally’s Place lives on. I love it when I read or see examples of people keeping their word…as in the old days, seal the deal with a handshake. And this is why, “Shop Small” and “Keep It Local” means so much in a world that has gone astray…Congratulations for keeping it alive Ron! Show me a man of his word and I’ll show you a successful business man! Keep up the good work!